Along with its Gmail design overhaul yesterday, Google relaunched its Tasks app. It’s now available within your Gmail inbox when you activate the new interface, as well as on Android and iOS. Sadly, it’s as barebones as any to-do app I’ve ever used. 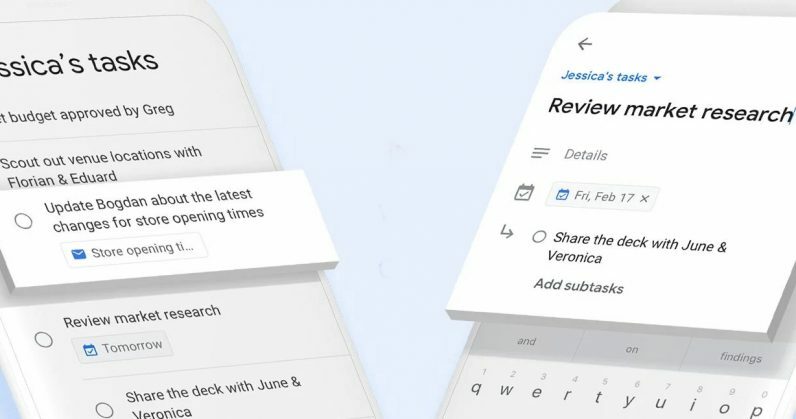 I’m all for apps that keep things simple and don’t overwhelm users with a boatload of features they won’t use often – but at the moment, Tasks isn’t better than anything else out there, not even Google’s own Keep note-taking app. As it stands, Tasks lets you create lists and add to-dos within each of them; you can add textual details, a due date for sorting items chronologically, and sub-tasks. You can’t set reminders, share lists with others, assign tasks to people, add tags, send text from a different app to turn it into a to-do, or even have it recognize things like ‘tomorrow’ and ‘next week’ to automatically set dates. Heck, there isn’t even a home screen widget or support for adding tasks with Google Assistant. But Tasks product manager Florian Goerisch also noted that there are plans to bring additional features to the app. So, while I appreciate the thinking behind Tasks, I don’t see myself using it extensively or recommending it until it gets better at the one job it’s designed to handle. With Tasks, Google seems to be making the same mistakes as Microsoft did, when it launched To-Do, a basic task manager that was meant to replace the feature-packed Wunderlist app it acquired in 2016. In trying to strip a to-do app down to the basics, the company has missed out on essential functionality that most folks would expect in a modern app, and that would make for a more comfortable user experience without muddying up the interface. Its only major selling point is that it shows up in Gmail’s new sidebar. But so does Google Keep – and it’s great for task management. You can use it to create lists, tag and share them, and set reminders. There are plenty more features that I’m not going to get into – but essentially, this is Keep beating Tasks at its own game. I understand that even in its current form, Tasks might find a fan or two. But there’s clearly room for improvement, and it strikes me as odd that Google would choose to launch a product that’s clearly in the early stages of development. Hopefully, it will get better over time, with the same guiding principle of simplicity in mind. Find Tasks in Gmail’s desktop web interface (you’ll need to turn on the new design by clicking on the gear icon in your inbox and choosing the option there), on Google Play, and in the App Store.